These ducks are my dinner. So last week J promised Aliens and here they are. This was a craft that we made during the February break. 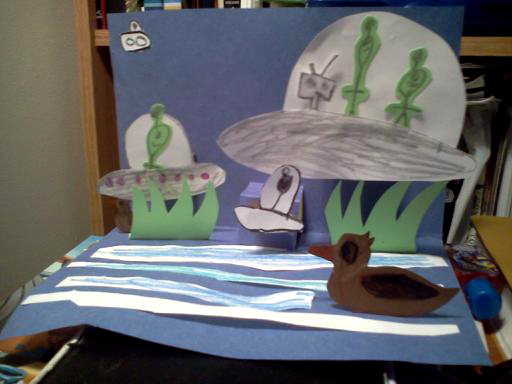 When building the artwork J made two ducks so that one would be him and one would be his little brother. J says next we’re going to have dinosaurs in your face! I was gonna ask if it was a pun. I only see the one duckling, is the other hiding? Or did you take two pictures, one with the J Duck and the other with the A Duck? Either way, it’s pretty cool. 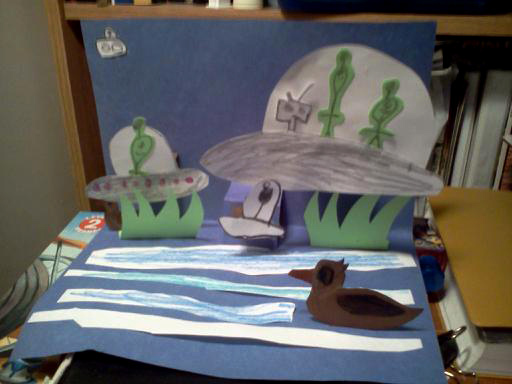 The A ducky is being scooped up by the alien in the background. It tried to hide behind the weeds on the left, but was caught anyway.